Usually the serpent is an ill-omen. Not so in the case of this Viperstone Ring! Carnelian stones like the one on this ring symbolize passion and desire, and this snake seeks to suffuse itself and its wearer with its energies. 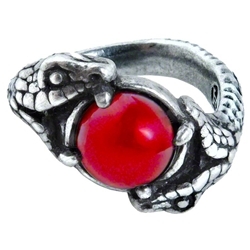 The ring is crafted from fine English pewter into the shape of a two-headed serpent, whose open mouths sink their fangs into a round carnelian agate gemstone at the center. Elegant and decadent yet gothic in its appeal, this Viperstone Ring evokes images of the tempting serpent from the garden, daring any who see it to try it on and test its power for themselves.